So, last night's episode of The Strain had our heroes conduct an autopsy on the freshly-dead vampire, killed in the final moments of the previous episode. The actors played it straight, reacting with barely-contained shock and horror as the examination went on. I was left wondering if such a sterile examination of this frightening thing didn't make it considerably less frightening. The scene was graphic enough. Having become useless, organs like the heart and lungs shriveled up to make room for others— including a six-foot-long 'stinger' delivered through the mouth. Yech. Then Dr. Goodweather said something that (for me, at least) robbed the moment of its horror: "It's a parasitic mechanism. It's re-writing biology so it can reproduce and consume its host." I found his words dry, clinical, final. The concept was frightening, sure, but considerably less so for having gotten a good, unflinching look at it on a gurney. 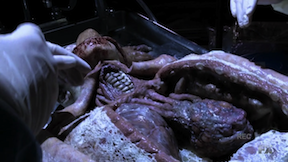 This is the third such autopsy I can recall: the first was in Blade II, examining a vampire infected with the Reaper virus. Blade vampires typically burnt to ash on being killed. The Reaper left behind a corpse, seemingly so the film could have some exposition on what separated Reaper vamps from their predecessors. Recently on Penny Dreadful, Victor Frankenstein peeled away the layers of skin and bone of a centuries-old dead vampire: a monster with an exo-skeleton, tattooed in black magic hieroglyphs. In that case the answers were less defined, and helped deepen the mystery of what the hell they were dealing with. Every answer just led to more questions. I strongly feel that by exposing these creatures to the harsh light of science and medicine, they lose any magic or mystery; any chance of being more than what's left on the slab. Dracula crumbled into dust, after death. Werewolves tend to revert to human form upon dying, in most popular fiction. It's almost a defense mechanism of the underworld: you don't get to look too closely at this. You don't get to understand. Could a coroner explain how a vampire to turn into mist, or a swarm of rats? How does this creature transform from human, to something hideous, and back again? What part of the brain prevents the vampire from entering a house uninvited? The short answer, according to The Strain: The coroner can't, and doesn't have to. This 'species' can't do any of those things. It's completely limited and bound by what science can document. It replaces the mythic, terrifying creature of old, with a viral-delivery system, gestating in a corpse. How sad. Do you disagree? If so, why? Please sound off in the comments below. Casey Jones is a writer and VO artist. He can enter a house uninvited, but is too polite to do so.